4 C’s is a lifestyle app. by Vision Promotional Group for anyone in need of an interactive diamond-buying guide. If you’re thinking of popping the big question to your significant other, or if you just want to buy yourself a beautiful ring- you need to know about the 4 C’s: Carat, Color, Clarity, and Cut. This app. walks you through all of these, giving you all the information you need to ask the right questions and make decisions while ring shopping. There are 5 sections within 4C’s- the first is an Introduction section with general diamond information, a FAQ section, and a feedback form where you can email Vision with comments or suggestions. The other 4 sections are for each of the C’s, each containing written information on their topic and some sort of interactive feature. For example, in the Color section, you can scroll through the different color grades to compare what the grades look like from Colorless to Light Yellow (D to Z). In the Cut section, you can select any of the different cuts to see what different shapes/faceting styles look like. All of the sections are easy to navigate through, clearly organized, and contain a wealth of information. There’s so much to learn about diamonds! The graphics are mostly simple white line formations on black backgrounds, except for the sections involving color, and one realistic photograph of a woman with a ring on demonstrating carat weight in the Carat section. The fonts used are pretty small because there’s so much contained in each section. When you tap on something in particular to look at it, the font of the link changes from white to a yellow/orange color. The best part of the look of the app. is that you get to look at diamonds in all different ways! I wish the info sections at the bottom of each page were larger, because they are difficult to scroll through. The other option would be to have the info sections stay the same size, but with the ability to enlarge when you tap them. I’d also like to see more real diamond pictures in conjunction with the diagrams. If you are getting ready to spend 2-3 months’ salary on an engagement ring, then the $1.99 for this app. is worth it to have all the knowledge you need at your fingertips. Happy shopping! 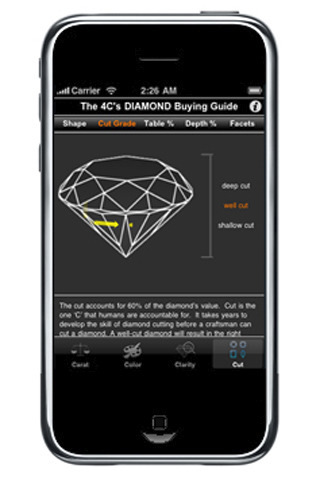 AppSafari review of The 4 C’s Interactive DIAMOND Buying Guide was written by Tyne Kennedy on April 4th, 2010 and categorized under App Store, Education, Reference, Shopping. Page viewed 4065 times, 1 so far today. Need help on using these apps? Please read the Help Page.